This application manual is the result of a two weeks tailor made advanced training course project, conducted in the framework of the DevCoCast at the Faculty ITC of the University of Twente, in Enschede, The Netherlands in February 2011. Over 30 participants from various African, Latin American and European Universities, (Space) Research and Training Centres and European – African International Collaboration Projects have participated in this course. Most participants have been attending previous workshops and other short training courses which have been conducted in the framework of the DevCoCast project in Africa, some in conjunction with AMESD, and Latin America. 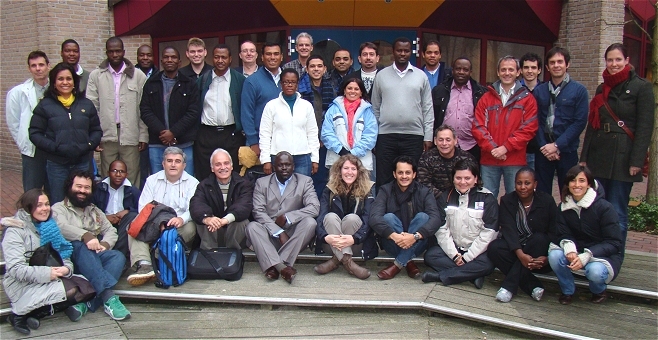 After having acquired a sound subject working knowledge by the participants, the main objective of this advanced course was to develop applications, demonstrating the use of the data disseminated via GEONETCast, a dissemination system using telecommunication satellites (broadcast), and more specifically those from the DevCoCast channel, within this system. After an introductory chapter, describing the GEONETCast system and the role of the DevCoCast project, various chapters highlight applications developed by the participants during the course, using where possible in situ observations and linking these to the processing and analysis of various remote sensing images and derived products. Application fields covered range from vegetation, biomass and different types of agricultural assessments, natural habitat conservation, insect and pest monitoring, rainfall and evapotranspiration estimation, hot spot and fire detection, drought monitoring and even some marine applications are included. Study areas selected are from South America, Eastern and Southern Africa. The overall objective of this manual is not only to demonstrate the advantage of using freely available data, disseminated via the low cost and highly reliable GEONETCast system, but also to make available a set of exercises that can be used within the curricula of Institutes for Higher Education within various disciplines or by interested individuals. The chapters describe the various (pre-) processing and analysis steps in a structured manner following a clearly described methodology for different application domains and their order has been randomly prepared. Powerpoint presentations are available to further underpin the described methodology and to illustrate the exercise outcome. To conduct the exercises, ILWIS372 needs to be installed as well as the so-called “GEONETCast toolbox” plug-in. Both utilities can be freely obtained and downloaded from http://52north.org, together with a user manual for installation and first time use. All related materials – the full manual, supporting powerpoint presentations, but also the sample data sets for all exercises, ensuring minimum compressed file size have been prepared and can be downloaded from ftp://ftp.itc.nl/pub/52n/gnc_devcocast_applications/. It is hoped that this document and the exercises it contains helps to further integrate the data delivered via GEONETCast and DevCoCast into the user community day-to-day practice. If you are interested in submitting a new exercise on your own application domain, feel free to contact the editors of this application manual. The Application manual will be updated as soon as new exercises become available. Objective: The main objective of this study is the quantification of the aboveground biomass production for the natural grassland of the Pampa biome using NDVI data calculated from images acquired by SPOT-Vegetation instrument. Objective: Using vegetation indices derived from SPOT-VEGETATION instrument to monitoring and identify agricultural areas with temporary (like maize, rice, soybeans, sugarcane) and permanent (coffee) crops as well as reforestation. Objective: The objective of this application is to estimate daily Evapotranspiration (ET) using the Surface Energy Balance System (SEBS) Model to know the ET pattern over irrigated areas by center pivots, in MG State, Brazil using ILWIS and the GEONETCast Toolbox with data obtained through GEONETCast and DevCoCast. Since the Land Surface Analysis Satellite Application Facility (LSA SAF) also provides an ET product (SAF ET), the estimated ET calculated using the SEBS model and the SAF ET product are also compared. Objective: The main objective for this application is to assess the vegetation coverage at the municipalities from the Sao Paulo State (Brazil) using data from a temporal set of S10 NDVI images, acquired by SPOT Vegetation instrument, which are available from the DevCoCast project. After the validation of this methodological approach in a near future, it would be useful to implement a monitoring system using the vegetation cover and make it available to decision makers and for the society. Objective: The general objective of this application is to increase the role of crop modelling applications for estimating sugarcane productivity in Brazil by incorporating satellite remote sensing products to evaluate estimation of productivity of sugar cane crops. A number of tailored and GIS-compatible products are generated and integrated to quantify sugar cane productivity. Objective: This application proposes to develop a semi-operational procedure to estimate corn and soybean yield in Cordoba Province, Argentina. The procedure will be implemented in a regional framework making use of different ILWIS routines to calculate FAO Model productivity components, with NDVI data from MODIS satellite, and local (in situ) field information. Objective: In order to provide a useful tool in the calculation of feed balances for fields of the Pampas Region, the overall objective of this exercise is to generate the Aboveground Net Primary Productivity (ANPP) map using the efficiency model as proposed by Kumar and Monteith (1982). Particular objective of this exercise is furthermore to compute the annual ANPP for 2007. Objective: In order to provide a useful tool in the calculation of water balances for fields of the central region of Argentina, the overall objective of this exercise is to provide a procedure for the estimation of evapotranspiration (ET) for clear sky conditions, combining information derived from remote sensing in conjunction with meteorological data. Objective: Making use of TRMM rain rates to calibrate Meteosat Cloud Top Temperature (10.8 micron band) and transform a time series of MSG cloud top temperature images into Precipitation. Objective: Provide a tool and a source of hydro-meteorological data to scientists, resource managers, the general public and private decision makers. Therefore a blended product is developed based on the Hydro-estimator algorithm and daily rain gauge values using the Combined Scheme (CoSch) technique. Daily catchment information is calculated like: mean areal rainfall, maximum precipitation, percentage of the catchment with more than 1 mm, conditional precipitation, etc. This method can be applied to a region of interest. Objective: To determine whether there have been changes in vegetation growth in the IGAD region (Eastern Africa) using rainfall pattern and vegetation indices and to assess the intra/inter annual trends for vegetation conditions using low resolution vegetation indices. Objective: The aim is to develop (a) method(s) for relating remotely sensed drought indices from GEONETCast data with in-situ measurements/indicators, especially the relationships between the number of dry decades and vegetation condition index (VCI) and in-situ drought related crop condition and crop yield as a way to quantify and forecast the effect of drought on crop - and rangelands. Objective: To develop a near real time automated procedure using a multi-temporal threshold algorithm for forest fire detection using the MSG satellite. Objective: To develop a method that allows agricultural managers to conduct an up-to-date assessment of the current growing conditions using remote sensing data. Objective: Analysis and comparison of a high and low productivity period (summer and winter of 2009) in the Benguela LME using DevCoCast broadcast Ocean Color and SST and relating these to in-situ data collected on chlorophyll-a and temperature data. Objective: Investigate the trends in sea surface temperature (SST) from satellite platforms for the purpose of predicting coral bleaching “Hot Spots” along the coast of Tanzania. Objective: To develop a model that assists in assessing and monitoring potential areas susceptible to land degradation making use of available environmental multi-temporal satellite data from GEONETCast/ DevCoCast in support of policy making for combating land degradation at regional level. Objective: Use of remote sensing low resolution NDVI, small water bodies and TAMSAT RFE data (derived from SPOT VGT and METEOSAT) in conjunction with land cover and administrative maps for vegetation status anomaly frequency analysis. Objective: To demonstrate the use of geostationary satellite data to obtain spatial and temporal rainfall erosivity distributions over large areas. A method is presented to generate an instantaneous erosivity image by using the kinetic energy - rainfall intensity approach at a certain time observation point. Subsequently, daily rainfall erosivity estimates can be derived by aggregating the kinetic energy and maximum 30-min. rainfall intensity images. © This work is licensed under the Creative Commons Attribution-NonCommercial 3.0 Netherlands License. To view a copy of this license, visit http://creativecommons.org/licenses/by-nc/3.0/nl/ or send a letter to Creative Commons, 444 Castro Street, Suite 900, Mountain View, California, 94041, USA. DevCoCast Advanced course participants / contributors to the Application manual.